Journalists must rely on numbers. Whether writing about last night’s basketball game, changes that will affect property taxes or the percentage increase of burglaries in town, journalists have to know how to handle numbers and present them clearly. Although it is sometimes tempting to exclude numbers whenever possible, journalists have the responsibility to provide their readers with clear, accurate information and data. 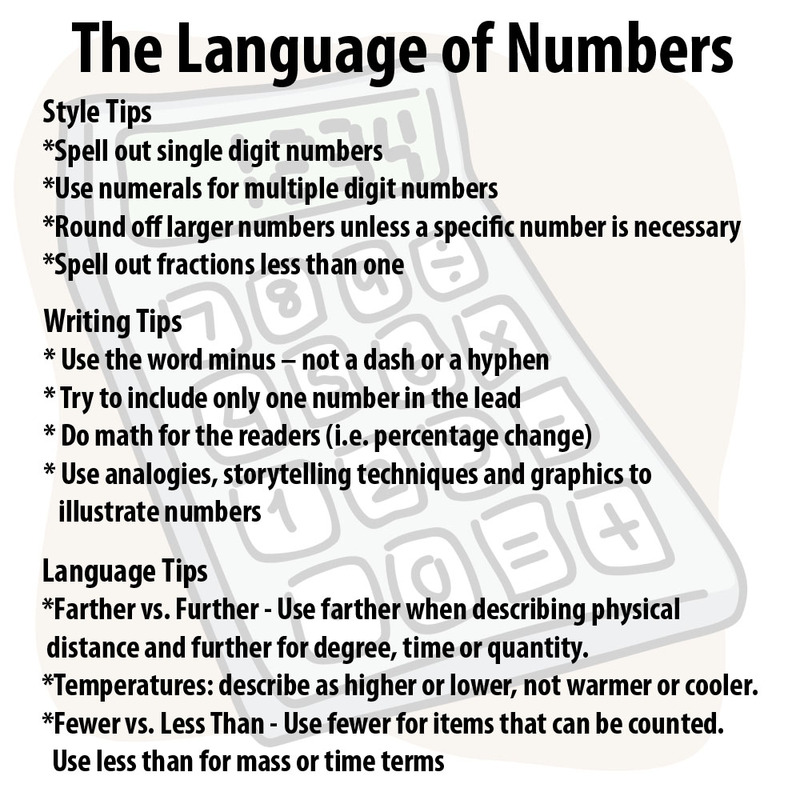 Most of the math skills journalists need are basic, and tips for dealing with the language of numbers, percentages, statistics and federal statistics are explained below. It is critical that journalists check the math of official reports and speakers before publishing a story. Sometimes numbers have been tweaked to look better or the individual presenting them lacked basic math skills. Also, just as important to consider the words that will accompany any numbers presented, for two reasons. First, readers must be able to understand what is being said, so the language a journalist uses needs to be clear and concise. Second, the use of a particular word can change the impact the number has, such as using more versus most. Percentages are used to show increases, decreases, percentage points and percentage of a whole. *Convert to percentage by moving decimal two places to right. This formula can be used to calculate percentage increase and decrease, but the answer for percentage decrease will have a negative sign in front of it. Calculating the percentage of a whole provides readers with perspective and can also be found through a simple formula. *Move decimal point two places to right. It is important to understand the difference between a percentage and percentage points. One percent is one-hundredth of something, but one percentage point may also be something different than one-hundredth of a percent. 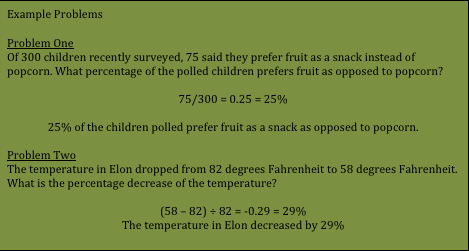 Percentages are often used for calculating interest. Money that is borrowed is referred to as the principal, while the interest is the money paid for the use of money. Journalists also commonly use statistics, particularly when analyzing surveys and studies and providing readers with numbers that are clear and accurate. This is particularly important, because stats are easy to present in ways that can make them look a certain way. To understand statistics, journalists must understand several key pieces – mean, median, mode. The mean, often referred to as “the average,” is the sum of all figures in a group divided by the total number of figures. 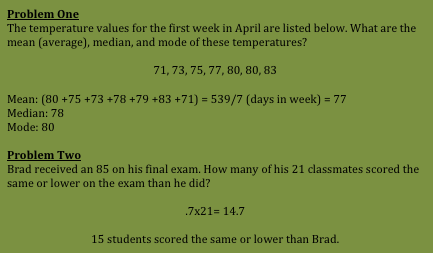 The median is the midpoint of a group of numbers. The mode is the number that appears most often within the grouping of numbers. Data and information is constantly made available by the government, and it is incredibly important for journalists to know where the info is coming from and how it impacts people. Reporters are often writing stories about inflation and consumer price index, gross consumer product and trade balance, but the one focused on in this section is unemployment rate. The labor force is everyone 16 and older who has a job or is currently seeking a job. The unemployment rate is the result of a survey of 60,000 households that is taken each month. One is employed if they have worked in the week before the survey was taken. An understanding of percentages, statistics and federal statistics are extremely important tools for journalists to have. Paying attention to these areas will allow for journalists to complete accurate reporting and writing.